This past weekend, I indulged a little and we went to TWO movies. First, date night with Hubby. We saw Maleficient and it was AWESOME. Sunday, we wanted to take The Spawn to X-Men, but there wasn’t a convenient showing so we settled for the new Spiderman movie, or as I like to call it…The Movie That Would NOT END. No spoiler alerts here other than save your money and go see Maleficient. The Spiderman movie was dreadful. I kept checking my watch. The only saving grace is that Peter Parker and Gwen Stacey were really likable people. But the movie dragged on…and on…and yes, ON. Characters are important. I don’t buy into the notion of character-driven or plot-driven stories. We need both. No one cares about the plot if we don’t care about the people. Conversely, we can care about the people, but PLOT is the crucible that drives change. A hero is only as strong as the problem he faces. What’s the GOAL? Where’s the ticking clock? What’s the hero supposed to accomplish? This log-line does an excellent job of telling precisely what this movie is about. Nothing, oh and everything. “Impacting his life?” Really? The log-line tells us exactly what to expect. Instead of genuine dramatic tension, we’re served bad situation after bad situation to the point of tedium. Running a gauntlet is NOT interesting. It’s CGI indulgence. Even The Spawn (Age FOUR) fell asleep. Additionally, the movie revolved around Parker keeping Gwen safe. This is a passive goal. It’s like “containing Communism.” Doesn’t work and just drags on. Basically, we should be able to tell someone (an agent) what our story is about in one sentence. That is called the “log-line.” Log-lines are used in Hollywood to pitch movies. In fact, a book that should be in every writer’s library is Save the Cat by Blake Snyder. It’s a book on screenwriting, but every writer can benefit enormously from Snyder’s teaching. In the world of screenwriting there is a tenet, “Give me the same, but different.” This axiom still holds true when it comes to novels. Our story cannot go so far off the deep end that readers cannot relate, but yet our story needs to be different enough that people don’t just think it’s a bad retread. We as writers have to negotiate this fine balance of same but different, and that is no easy task. Great log-lines are short and clear. I cannot tell you how many writers I talk to and I ask, “What’s your book about?” and they take off rambling for the next ten minutes. Often why writers are so terrified of the pitch session is that they cannot clearly state what their book is about in three sentences or less. Here’s a little insider information. When we cannot whittle our entire story into three sentences that is a clear sign to agents and editors that our story is structurally flawed. Not always, but more often than not. Your goal should be ONE sentence. What is your story about? A good log-line tells the entire story. You can almost see the entire story play out in your head. This is the log-line for Maleficient. It’s rich with emotion, complication and irony. In the protagonist’s anger she creates the story problem. How can she heal the kingdoms? We also get a glimpse of the character arc (vengeance to forgiveness?) and the goal (break the curse). Think of your one sentence as your scale-model or your prototype. If the prototype doesn’t generate excitement and interest, it is unlikely the final product will succeed. So revise the prototype until you find something that gets the future audience genuinely excited. ****This is what I teach you how to do in my Antagonist Class. At the Gold Level, we work one-on-one until you have the one sentence DOWN and then plot from there, which is WAY easier with a solid log-line. Use WANA15 for $15 off. Is your log-line on target? I’ve seen two behaviors in all my time working with writers. Either a writer will wander off down the daffodil trail because he is afraid he lacks the skills to tell the story laid out in the log-line, OR the writer will water down the log-line to begin with. Through future plotting the writer will realize hidden strength…then he can go revise the plotting or revise the log-line. For this literary folks, here is a log-line for The Road. In a post-apocalyptic Earth where every living thing but humans has died, a Man (protagonist) must travel cross-country with his son to the ocean (active goal) while battling organized, militant group of cannibals who hunt people (antagonist) and yet must still protect their sacred humanity in the face of certain death by starvation (stakes). Plot Goal: Make it to the ocean Character Goal: If they resort to eating people they fail. So here’s an exercise. See if you can state your novel in one sentence. It will not only help add clarity to your writing and keep you on track, but when it comes time to pitch an agent, you will be well-prepared and ready to knock it out of the park. Practice on your favorite movies and books. Work those log-line muscles! What are your thoughts? Have you nearly had a nervous breakdown trying to get your story into one sentence? Have you used this log-line technique and discovered you had to change it and make it stronger? Did it save you needless revision? 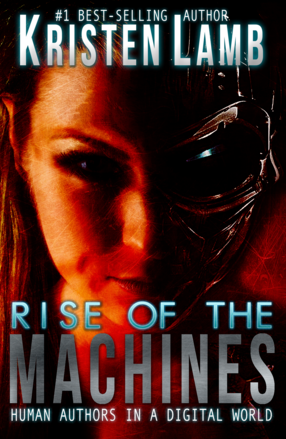 For those who need help with branding, blogging and social media, please check out my latest book, Rise of the Machines—Human Authors in a Digital World. My Antagonist Class is coming up. At the Gold Level, we work one-on-one until you have the one sentence DOWN and then plot from there. The beauty of this class is once you’ve been through this process, it will make you a faster, better leaner plotter in the future and will save SO MUCH rewrite. Use WANA15 for $15 off. If you think you might need some professional help, I have my First Five Pages Class coming up. Use WANA15 for $15 off. Also there is a GOLD level. This is NOT line-edit. This is ripping apart your first pages and then SHOWING you how to fix the problems not only in the beginning of your book but throughout.